August | 2013 | LIT.GAZ. 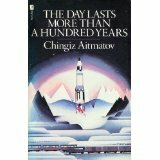 Reflections in the previous post were prompted by my re-reading of Chingiz Aitmatov‘s The Day Lasts More Than A Hundred Years, after half a lifetime. I’d hung on to the tatty paperback, knowing I’d want to read it again, eventually, but having completely forgotten why. And, as last time, I suspect, it disturbed me greatly. This plot unfolds against the background of a small community isolated on the Kazakh steppes next to a major railway line. The difficulty of their existence, and their history and myths are explored, and characters created and developed so that we come to understand them and their motivation. One of them is occupied with the need to arrange the proper (according to tradition and religion) burial of a revered older member of the community. And, as the past history of the community is revealed, so are the tentacles of the Stalinist police state and its ability to go even into the desert wastes and devastate lives. There is, of course, an allegorical dimension, with the history of the mankurt, a slave robbed of his mind and personality during the dark days of the Mongol invasions, a man who has no past, no personality, no future, and who would kill his mother if ordered to… how that got past the censors beats me, but then I have read many accounts of how intellectually limited censors often were. Aitmatov makes the reader think, and this has always been my touchstone for an author worth reading. Would the human race really reject contact with other, alien, races because of a possible threat to the status quo? What happens to people when they are separated from their past, their traditions, their roots? Aitmatov’s answers are pessimistic, rooted in the Cold War era (the novel was first published in 1980), but I don’t see any different conclusion in our ‘free’ age. How much we are in fact mindless slaves to a greater power is open to discussion. A good novel from the days of the Soviet Union. One thing I have read a great deal of is literature written in the Soviet Union or during its existence, in other countries that were known as the Soviet bloc. Literature written during a dictatorship is a very different beast from that produced in ‘free’ countries. As far as I’m aware, there was not much literature written or published in Nazi Germany: most writers fled the country and carried on in exile. But the Soviet Union lasted much longer, and not all writers went into exile. I’m also aware that, in the nearly quarter century since the revolutions in Eastern Europe which led to the collapse of the Soviet Union, a new generation has grown up, which know astonishingly little of those times generally, and the literature in particular. And this concerns me, because so much powerful literature was written during those times. Some of it was translated into English and published here, but a lot of it was not; is it all going to vanish into history? There are several kinds of writer from those times: those who knew that what they were writing could not, or would not, be published, and so wrote ‘for the bottom drawer’ (as it was called) or who took the enormous risk of smuggling their manuscripts abroad for publication. So, for example, Vassily Grossmann was told by the KGB that Life and Fate (his epic novel centring on the battle for Stalingrad, that has justly been called a War and Peace for the twentieth century) could not be published for two hundred years, and Aleksandr Solzhenitsyn was eventually driven into exile because novels such as The First Circle and Cancer Ward were published in the West. And then there are those who wrote, and whose novels were allowed to be published, with or without alterations, but always after having gone through censorship. An enormous number of these were undoubtedly hackwork, but by no means all of them: in other words, some decent literature came out of a totalitarian state. Another thing that isn’t widely known is the huge number of books published in the Soviet bloc countries – turgid political tracts by the million, certainly, but also quality literature (safe works like the classics of the past) at very cheap prices because culture generally was intended to be available to everyone. I’m reminded of this when I see the cheaply produced books sold for ridiculously high prices here in the ‘free world’. So, what were the constraints on authors? Various topics were completely off-limits, particular recent history, politics and religion. Others had to be handled very carefully if there was to be a chance of publication. I haven’t really formed the impression that writers’ expression was thereby limited; writing was often more symbolic or allegorical in order to avoid censorship, but most of the themes, tropes and topics that have always been explored in good literature are there, if treated and explored in different ways. I realise that much of what I’ve written is subjective and provocative; no apologies for that, as it comes from a lifetime of reading, but I hope that I shall be able to provide some evidence and justification in future posts. Grim reading, but necessary preparation for an upcoming trip to see the battlefields. I taught the literature of the First World War for many years, and have visited the Belgian battlefields but never those on the Somme. 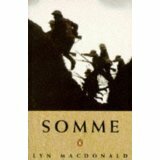 This book was written thirty years ago, so Macdonald had access to the personal testimonies and recollections of many veterans, none of whom are now alive, almost a century after the start of the war. It’s their accounts of their experiences that are most moving, in many ways: horrors retold in a matter-of-fact way, perhaps the only way of telling them… and the realisation of the insane things they were expected to do by their commanders. This perhaps not from any innate wickedness of the high command, but from lack of information about real conditions on the ground, and lack of imagination. The over-riding impression that comes across of the entire battle, which lasted several months in its various stages, even though it’s the slaughter of the first day that’s usually most remarked upon, is of chaos – nobody knowing what was really going on, or what it was best to do in the circumstances. Macdonald’s book is very helpfully illustrated with clear maps and annotated photographs, but I still find it all hard to imagine, and perhaps seeing the actual places will be illuminating. I watched the epic BBC TV series when it was first shown in the 1970s, and it made a lasting impression. I was glad to be able to see it again when it was repeated recently, and also somewhat alarmed to hear that there was talk of a re-make of the series. Watching it again reminded me of how brilliant it was in the 1970s, and also helped me realise why a re-make will probably be necessary for a twenty-first century audience: although the cast is excellent, we now expect much more realistic and graphic violence, and also much more explicit portrayal of sexual activity, and there is scope for both of these in a new filmed version of the novels; current tastes and expectations do make this old version seem extremely coy and reserved, if not actually laughable in places. 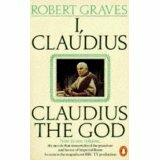 However, watching I Claudius again sent me to the novels, which I realised I’d never read. Having studied Ancient History at school, I was aware of how little (relatively speaking) information had survived two millennia, and so had imagined that it was basically Graves’ imagination at work. However, it’s clear that he researched thoroughly and went back to all the available sources, not just the obvious ones, and so there is evidence for most of what he writes, in terms of their accuracy as historical novels. Eight hundred pages of the life and adventures of Claudius and his family and ancient Rome is a little tiring, but also fascinating: Rome (although I’m not sure about other parts of the empire) is a horrifically bloody place, utterly corrupt in terms of economics and morals. What came across quite strongly to me was the power of women behind the scenes, in terms of manipulating powerful men, and poisoning them in order to get their way, and also the inevitability of the empire and its corruption, in that what was originally a small city-state could not manage its control of most of the known world ‘democratically’ (no change there, then!). There’s also a detailed portrayal of Roman religious rites and rituals, and the genesis of Christianity, which also took place during the time-frame of Claudius’ account, treated from a Roman and Jewish perspective. In the end, unless you’re seriously interested in Roman History, the TV series will do. Another of Eland‘s nicely-produced re-issues of travel-writing from the past, but I’m not really sure how to take this one. It’s from the 1830s, and Alexander Burnes was basically a British spy at the beginning of what is, I feel, insultingly called ‘the Great Game’ – the rivalry between empires, especially the British and Russian, over the lands in the Middle East. He basically blagged his way up the Indus river, across what is now Pakistan and Afghanistan, pretending, lying and deceiving the local inhabitants, whilst secretly mapping and storing information which would later be invaluable in Britain’s empire-building and outwitting the Russians, and for which he was much praised by his colonialist superiors. And yet, it’s a fascinating account of the places and the people from nearly two centuries ago, with lots of detail, and an extremely good (original) map to help you follow the journey. Burnes took considerable risks, and, because he was a spy in disguise, came into close contact with people and their customs and way of life, through his familiarity with their language. What offends me really, I suppose, is the tone of superiority that sometimes comes through towards them, confident in the military power of the British. On the other hand, his explorations eventually led to the first British adventure in Afghanistan, which was a disaster, like all subsequent ones, including the present unfinished business there. but not a post about Proust, I’m afraid. I’m interested in texts that create vivid and moving pictures of a past time or era, having recently re-read The Leopard, by Giuseppe di Lampedusa, a picture of the fading of semi-feudal Sicily towards the end of the nineteenth century, as the unification of Italy progressed. It was made into a film by Visconti, to considerable acclaim. The writer gives his portrait of the aristocratic family, their homes and possessions a nostalgic and wistful feel, as we share his sense of regret of the fading and passing of an era, as well as understanding and perhaps accepting its inevitability: the world moves on, and people and places are left behind. A sense emerges of a great, though surely not tragic, loss. Some people do not understand that the times they live in are changing, and are defeated by time: others can see and become part of those changes. The power of a great writer is surely to make her/ his readers reflect on their own existence and its meaning, and Lampedusa certainly succeeds here. As I read, or rather, re-read, therefore knowing and remembering what was going to happen as the story drew to its conclusion, I found myself reminded of Evelyn Waugh‘s Brideshead Revisited. Here is another, though very different world, a world of naivete and innocence which is vanishing, but this time looked back on later by one of its key participants; the framing of Charles Ryder’s story is crucial to its effectiveness, and sense of loss, and perhaps the love story at the core renders it more powerful, even tragic. Lampedusa also looks back on his story and its characters, but this is from the omniscient author’s ironic perspective, and the effect is necessarily different, perhaps embedding a sense of historical change more deeply. Then I was reminded of Philip Larkin‘s poem MCMXIV. Short, and powerful, it captures the essence of the England that vanished as a result of the Great War, and embeds the totality of the change as well as the complete ignorance of it by those alive at the time: you don’t know what you’ve got till it’s gone, as the song has it. I would be interested if anyone knew of any works that succeed in capturing similar effects. As someone with Eastern European connections, I’ve long been fascinated with the past of towns, places and regions which have disappeared from the map, been renamed or moved from one country to another. This geographical fluidity is something that is completely unknown to Britons, and most Western Europeans, though very familiar further east, where it is often connected with tragic episodes, warfare and bloodshed. I think I have developed a somewhat romantic picture of the Baltic region from novelsts such as the Estonians Jaan Kross and Sofi Oksanen; it seems to be a lost, out-of-the-way and even abandoned corner of Europe, to be sure with plenty of ghosts from its past. The best descriptions I’ve come across were in Bernard Newman‘s Baltic Roundabout, and since that was written in 1937, the pictures are rather dated.